I’ve written a number of blog posts over the last two years referencing my B2B demand generation strategy book project, and — as a number of you have noted — I’ve been much-to-quiet over the past five months. It also will be available on iBook, Kindle and Nook shortly thereafter. I’m particularly excited to announce the book’s release to the community of B2B marketers I’ve worked so closely with over the years. I think this is a book you’ll find very useful in helping to take your B2B demand generation programs to the next level. And I look forward to your feedback on it. The goal of the book is to help B2B marketers fundamentally transform their demand generation approach – building perpetual, buyer-centric programs that contribute to predictable and sustainable revenues for their organizations. The book also helps B2B marketers re-position their role, from tactical execution manager to that of strategic demand-chain manager – a critical shift. B2B marketers need more than a minor course correction. They need a massive overhaul in their approach to B2B demand generation. 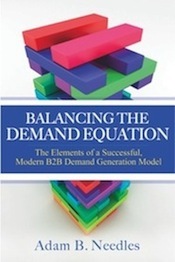 Balancing the Demand Equation delivers both the rationale and approach to help B2B marketers succeed in this re-alignment and to emerge as leaders in the new B2B demand chain. Click here to download a PDF overview of the book and its table of contents. There’s more to come on the book and its release, and I’ll keep Propelling Brands updated with the details over the coming weeks. Also, I’ve picked back up my blogging again. This past week I published a new post on the Left Brain DGA blog site, titled “The Real Cost of Retaining a Legacy Approach to B2B Demand Generation … And What You Can Do About It.” And I’ll be doing more posts in the near future around many of the topics in the book. Congratulations Adam, it’s a monumental project to get a book to completion, and it’s great to see this one make it through the process. You have a ton of wisdom to share with readers, and anyone who reads this book will be upping their demand generation game significantly. Well done! @Steve + @Ed – Thanks for the kind words, gentlemen. Can’t wait to share the finished product with you guys.